Obsolete Technology was a Conjunction event from The Fish Factory, Penryn and CMR, Redruth organised by artist and curator Camilla Stacey, in collaboration with Alice Mahoney, Stuart Robinson and Rose Hatcher. The day aimed to bring together artists and creatives with an interest in analogue and ‘obsolete’ technologies used today in a range of fields including film, photography and sound work. 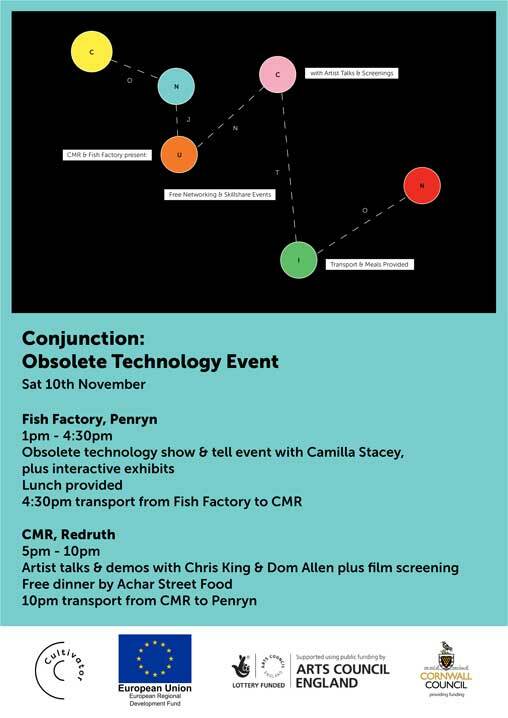 After an afternoon exploring examples of obsolete technology in a series of hands on sessions at The Fish Factory, Penryn participants were invited to an evening programme at CMR, Redruth. The event took place on Saturday the 10th of November and the day began at 1pm at The Fish Factory with introductions and a free networking lunch. After lunch there was an opportunity to explore and experiment with a variety of 'obsolete technologies’. This included photographic slide manipulation, Record Player 'Phonotrope’ animations and toy technology hacking. Participants were also invited to bring their unusual analogue technology as part of a 'show and tell’ and share their knowledge and skills with other participants. At CMR from 5pm there was an introduction to the event and a free networking meal from Achar Street Food and continued with talks from artists Chris King and Dom Allen. Chris King is an artist, educator and conservator primarily concerned with historic and contemporary electronic video and media art based in London. His blog and online discussion group ‘Video Circuits’ explores early abstract and synthetic image making practices such as video synthesis, experimental animation, visual music, cymatics and graphic scores. Dom Allen is a sound artist based at The Old Grist Mill in Penryn. His work includes ‘The Anthropological Organ (a contemporary and Heath Robinsonesq reinterpretation of a traditional fairground organ, complete with a full rank of MIDI controlled organ pipes and inbuilt lighting), circuit bending and workshops including ‘Make your own Theremin’. The exhibition included work from artists, makers and scientists working with the themes of Obsolete Technology. It included a visualisation of the abandoned mines in the Redruth and Camborne area by Keith Russ, short films from Guy Oliver, an interactive computer game for the ZX Spectrum by coder and animator Simon Daly, screenings of work from Stuart Robinson and work created during the practical sessions at The Fish Factory in the afternoon.